The UNI-T UT210E current clamp multimeter costs around £30. I bought this because in addition to AC, it can measure DC currents via the clamp, down to a resolution of 1mA. That's pretty unusual for a clamp meter - especially a cheap one - and that makes it useful for a lot of electronics work, along with troubleshooting electrical problems with vehicles, etc. I was planning to write a separate review of this unit, but decided to include it here in the Budget Multimeters section because of its low price and the fact it is fairly useful as a general instrument in addition to being a current clamp. As well as current, it measures AC and DC voltage, resistance, continuity, diodes and capacitance. It also has a no-contact voltage detection mode. AC measurements are true RMS. This is a 2000-count meter with 0.7% basic DC accuracy. It runs from a pair of AAA batteries (not supplied). The safety rating is 300V CAT III and 600V CAT II - perhaps more realistic than some of the meters we've looked at here. The box is mine arrived in is colourful, but mostly printed in Chinese. Inside is a black carry case that contains the meter, probes, English instructions, Chinese instructions, and a certificate of some sort. The manual is a pretty poor translation - worse than most of the others seen in this section. The probes are quite reasonable for the price point, being full size and fairly flexible. They are rated at a claimed CAT II 1000V, or CAT III 1000V and CAT IV 600V with the additional tip covers in place. The current rating is 10A, but that's not so relevant here because all current measurements are done using the clamp. The unit meter feels very solid. The case features soft-touch overmoulds and is very compact. The mode switch is operated from the side, and works fairly positively. Like most cheap meters, the meter beeps with every change of position. Additionally, there are three membrane-type pushbuttons for Hold/Backlight, Zero and Select/VFC. It's quite basic in operation. The voltage and current ranges default to AC - press Select to change to DC - which would be annoying if this was a general-purpose DMM but is fair enough when you consider the expected application of this. The display is sideways on, so to read it, you have to have the meter on its side. The LCD has excellent contrast and viewing angles, with digits the same size as the Fluke 101. There is a backlight, but of course it only stays on for 15 seconds! As mentioned, all current measurements are made using the clamp. The best available resolution is 0.1mV on DC, 1mV on AC, 1mA, 0.1Ω and 1pF. Auto-ranging is similar to the Aneng meters, and the settingly time is pretty quick with no overshoot. There is no manual range button. The Hold function is the usual simple hold, so much less useful than "Touch-hold". It's nice to have the Zero button, which allows relative measurements, but it turns out it's essential on the 2A DC current range, whereby the meter is very sensitive to stray magnetic fields (not surprisingly). Checking the AC bandwidth, I found that the -3dB point is - guess what? - 3kHz. Sound familiar? Seems they must be using the DMT0660 IC that we saw in the Aneng meters (and BSIDE ADM08A) earlier - this IC can be put into 2000-count mode by setting the appropriate config bit in the EEPROM. While I was at it, I checked that it is indeed true RMS. Though interestingly, adding a DC offset to the signal caused it to start beeping and giving erratic readings. This only happens if you suddenly apply the offset; if you gradually turn up the offset, it's all OK until the offset reaches about 12V, at which point it starts to over-read the voltage - perhaps the AC coupling capacitor is leaking because it's a low-voltage unit? Either way, this could be a problem as it's quite realistic to want to measure AC signals sitting on a DC voltage. The diode range gives around 3.25V - which is independant of the battery voltage - so can be used to test LEDs, including blue and white ones. Continuity is latched and works as well as the Aneng types, though not as fast as a good Fluke. It works at 50Ω, but is very quiet, and quite hard to hear in a typical workshop environment. Current consumption from the two AAAs varies between 0.9mA and 1.7mA, until you switch to the current ranges, where the current rises to 7mA. Sounding the buzzer in continuity results in 26mA in total. The backlight takes 6.7mA. Auto power-off is only 15 minutes, but like the other DTM0660 meters, you can hold Select while powering up to disable auto power-off. Doing so removes an icon from the top-right of the display that is usually present to warn you that auto power-down is enabled. As with the others I've tested though, it'll still beep at you every 15 minutes. The low-battery behaviour is exactly the same as the other DTM0660-equipped meters, with the low indication coming on at 2.5V - a bit higher than others I've tested, but close enough - and the unit continues to give accurate readings until it switches off at 2.2V. If you leave it to power down automatically, the current consumption is only 2µA. 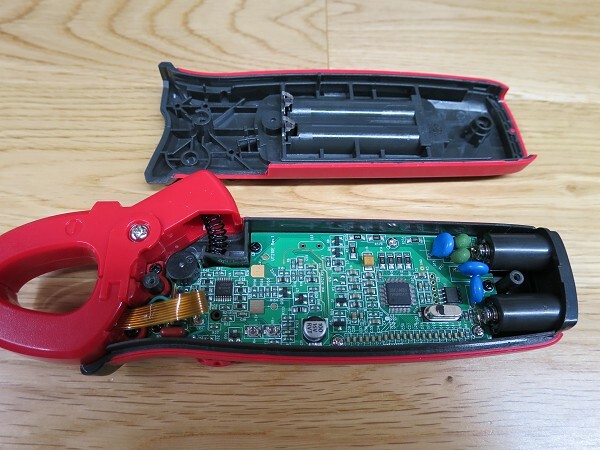 Simply remove the two self-tapping screws - there is no need to remove the batteries. But for reference, the battery cover is secured by a single machine screw which has a partial thread so it stays captive with the lid, which is a nice touch. There is the expected metal insert in the case for this screw. At first glance, there is some fairly reasonable input protection. There are 3 MOVs and a pair of PTCs. Things are pretty cramped in there - this unit really is tiny - so it's been hard to provide much clearance in the area of the input terminals. Anyway, the mode switch is clear enough, and to the left of that is LED3 for the NCV detection. Towards the middle is LED2 for the backlight. I have no idea where LED1 is hiding. The missing transistors are interesting - at a glance, it looks like Q8 and Q9 would form a high speed clamp for the voltage signal (it comes up on the via just to the left of L1). Note R27 (and R27A and R27B) - together these form a 900k resistor that might be related to the Ohms/diode/continuity/capacitance function - as you can see, these are fed directly from the input terminal. There are no nice MELF resistors used for the dividers, unlike many of the other meters. The main IC is the DM1106EN, as used in the Aneng AN8008. This is an improved version of the DTM0660, with 10,000-count capability, though that's not needed here. Earlier versions did use the DTM0660. Note that the PCB is still Rev. 1, so no changes to the PCB were needed to move to the newer IC. Next to it is the EEPROM, with space for a rather convenient header that could connect to a programmer if you wished to hack this. The crystal is 3.999MHz - wonder why it's not the usual 4Mhz? At the top right is the positive input terminal with two PTCs connected to it. The other end of each of those goes to a MOV, and the junction of those MOVs connect to the third MOV, which in turn connects to the negative input terminal. I think this is the largest number of protection components that we've seen in these budget multimeters, but the small clearances worry me - and there are no isolation slots or similar to help. The terminals themselves are good quality for a cheap meter. Note R37A to R37D at the top. These 2.5MΩ resistors form the 10MΩ input resistance for Volts. R11 to 14 provide the different ranges. There is a large number of capacitors at the bottom, which appear to be connected to the LCD pads - possible EMI control, perhaps? Most of the parts at this end of the PCB are dedicated to the current clamp function. 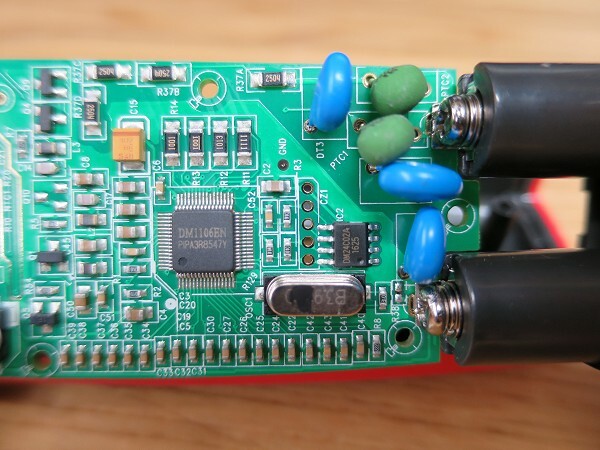 The IC is an OPA4330, which is a quad micropower low-drift opamp. I haven't determined what the pre-sets do, but assume they are related to the current function. Note the green wire, which is either the antenna for the NCV detection, or a ground wire for the core of the clamp. J1 is the header for the clamp flex-print - watch out for that, because the flex-print is very fragile and I managed to tear it slightly. I had to do a repair using a strand of copper wire, with superglue to protect the soldering and the rest of the flex-print. That's the first time I've ever damaged a flex-print, and I've been handling it for many decades, so personally, I'd like to think that says more about the quality of the unit rather than me. YMMV! That buzzer is about half the size of those seen in the other meters. I note a couple of NTC thermistors, and am not immediately sure what they are for. They appear to be part of the op-amp circuitry, so perhaps some temperature compensation is called for? Look at this - a damaged pad! 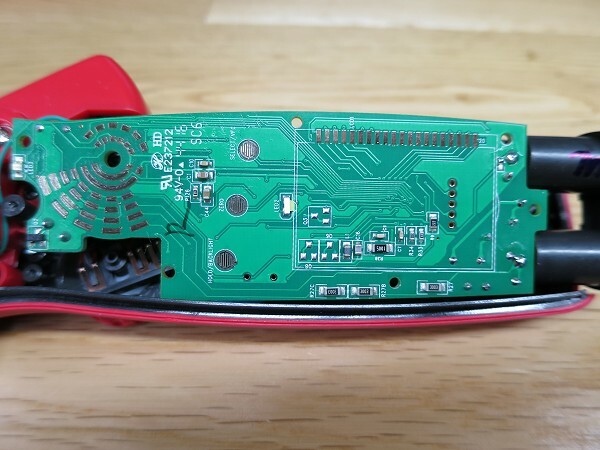 It looks like the PTC was moved after it had been soldered, and it's taken the pad off the PCB. 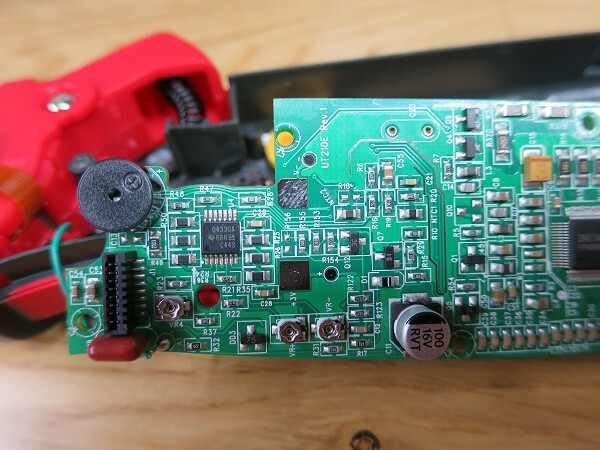 There is no track on the bottom of the board, so the connection is being made on the top side, but as the solder didn't reach that far, the actual connection is just as a result of the wire being in vague contact with the pad. That won't be reliable long-term, so I added fresh solder to that from above. Of the brands covered in this "budget" section, UNI-T is one of the bigger ones (ignoring Fluke, obviously). But this is the first meter that has had obvious construction quality problems. 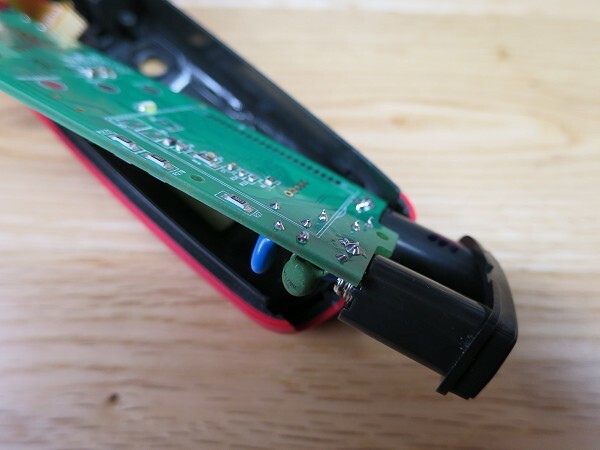 While the current clamp functionality is great, do treat it carefully, and if you take it apart, be especially careful with that flex-print connector. And watch out for the DC offset bug on AC voltage measurements. 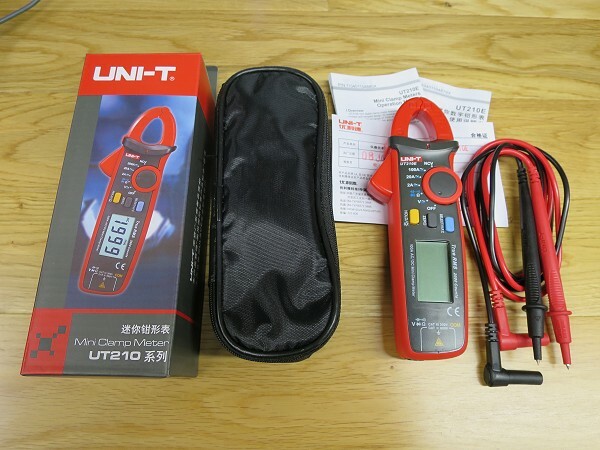 As I mention during the UT61E review, some of my previous bad experiences came from UNI-T meters, so I am naturally - some might say "unfairly" - cautious about their products. But aside from that, it does work as advertised, and is quite nice to use. Generally, I'm quite impressed - let's see how well it lasts! The meter hasn't been independently verified, so I'd advise caution when measuring voltage. Yes, there's a reasonable number of protection components, but things are very cramped in that area. This meter has been around for quite a while now, and there is a lot written about it. One hack is to add an output socket, so the clamp can be used as a rudimentary current probe. Other hacks include increasing the counts to 6,000 or more, and changing the auto power-down and backlight time-outs. Have a look at this thread on the EEVblog forum for lots more background.